Do you love uploading and sharing photos on Google Plus website? You can make this experience king size by uploading full size large images on your Google+ profile. By default, big photos are automatically re-sized to 2048 pixels on their longest edge during the upload process. 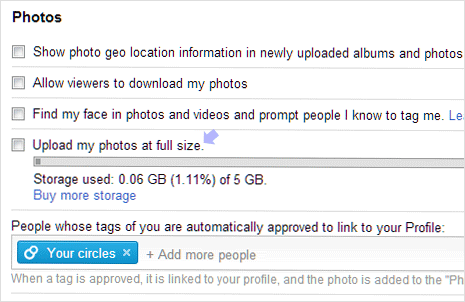 You can easily disable this photo re-sizing and share full size large photos with your Google+ friends. 1. Open Google Plus Settings webpage [google.com/settings/plus]. You will be prompted to login into your Google+ account (Google or Gmail account that you use), if not already logged in. 2. Photos up to 2048 x 2048 pixels and videos up to 15 minutes are not counted in your free storage. This means, you can upload unlimited photos under size 2048 X 2048 and videos less than 15 minutes of duration. 3. However, once you enable full size image uploads option – photos larger than 2048 pixels will be counted in your free storage quota. So, be careful while you start uploading full blown images on Google Plus – this will start filling your free storage quota at a faster rate. nice post. thanks. uploading photos without editing would be quick and fun.